Animal Ark in winter – That is in Nevada? Animal Ark is north of Reno, NV. We had been there in the summer, but never in winter. We found out that Animal Ark was opened for two weekends in the winter of 2017 . We decided to go up with our daughter and her boyfriend and we had a blast, but boy were we cold! It was so neat to see the animals be active instead of hiding in the shade like they do when it is hot. The actual bears were hibernating. We were seeing a lot of cottontail rabbit ‘remains’ in the enclosures. We were able to watch this jaguar catch this rabbit. The rabbit ran right for the jaguar! The staff thought it was since there was fresh straw, etc put out in the enclosures. I have to admit that I mentally have to think of Pepper (the golden retriever) with her stuff toys when I look at the above photo. This year Animal Ark will be open on Saturday January 13th, 2018 and Sunday January 14th, 2018. They will also be open on Saturday February 17th, 2018 and Sunday February 18th, 2018. I have no idea if there will be snow on the ground this year, but it would be nice to see the animals in their winter coats either way. If you are interested in going it is a good idea to either check out their posts on Facebook or check out their website a head of time. Red Rock Canyon – That is in Nevada? At the end of September the husband had a short work conference in Las Vegas so I tagged along and we turned it into a mini vacation. Most people think of gambling and shows when they think of Las Vegas, but since we live in Northern Nevada we didn’t do any of that. After spending our required 1.5 days on the Strip, for his conference, we got a hotel away from the Strip and went exploring. So, I found the Hampton Inn & Suites Las Vegas – Red Rock / Summerlin. It was is on the west side of Las Vegas and near the ‘loop’ road so I knew we could get to the areas that we planned on going without too much difficulty. Years ago we visited Las Vegas and Red Rock Canyon was a way outside of town. Well, that is not the case anymore. Las Vegas has grown a lot since the last time we had visited. It turns out the hotel I selected was 11 miles from Red Rock Canyon. So, in the afternoon, after the conference ended we went and explored Red Rock Canyon. There is now a nice visitor center and we drove the scenic route and took some photos. Since it was later in the day we didn’t go on any long hikes. Here are a few photos. Las Vegas is visible in the background of the upper right photo. So, when was a the last time you visited Las Vegas and did you go see anything besides The Strip? In case you are in the Northern Nevada area this summer here are some of quilting / sewing activities you might be interested in. Do you know of any other events in Northern Nevada? My family finally got to go on a much needed vacation. We have been home for just over 24 hours and I am happy that I have gotten two loads of laundry already. I figured I would post some tips that came in really handy for us (in no special order). Roll your clothes – If you aren’t on Pinterest you might not have seen the posts that by rolling your clothes you can store more in a drawer, etc. It really does work so I would suggest you try it next time. Detangler spray & TSA liquid rules – Each person is able to take a quart-sized bag with your liquids/creams as long as each original container is less than 3 oz. The humidity and salt water makes it so we get more knots in our hair so this time I put some detangler spray in a small bottle and took some with us. Bug spray – We usually go hiking when travel and this trip wasn’t any different. So, we bought a small container of bug spray and took it with us (in the quart-sized bag with our other liquids). Metal fork and spoon – I packed one for each family member. These came in very handy. Note: You are not able to take sharp knives in the carry on luggage so I took a couple of plastic knives. Plastic bowls – Since we had room in our suitcases (by not taking too many clothes and rolling what I did take) I was able to pack plastic bowls for each family member. These came in very handy for breakfast and for eating pie, etc (see #11). Plastic, see-through water bottle – You can take an empty water bottle through security. We filled it with water at the airports and put ice inside of it when we traveled and it helped keep our snack foods and drinks cold. Ice chest – The last few trips we have been able to put a collapsible ice chest in one of the suitcases. We used this to keep our drinks and snacks cold for when we went to the beach or driving around the island. Grocery store – Usually when we arrive we look for a grocery store so we can buy some food. This time we lucked upon a local grocery store chain (Tamura’s Market) which definitely had cheaper prices than the big mainland chain that we found the first day. We were even able to find locally made (Ted’s Bakery) pie. The Macadamia Nut Cream Pie was really good! So, hopefully these help you out and they will come in handy the next time we fly somewhere on vacation. I want to wish everyone a Happy Memorial Day. After just coming back from a trip that included Gettysburg, PA and Washington, D.C. (Korean War Memorial, etc) history (when it comes to war, etc) has become more alive for my family. Sometimes just reading about something in a book doesn’t have as much as an affect. Oh, and I will write posts about our trip later. I am surprised how much we saw and did in ten days. In March we went away for an extended weekend in Northern California. 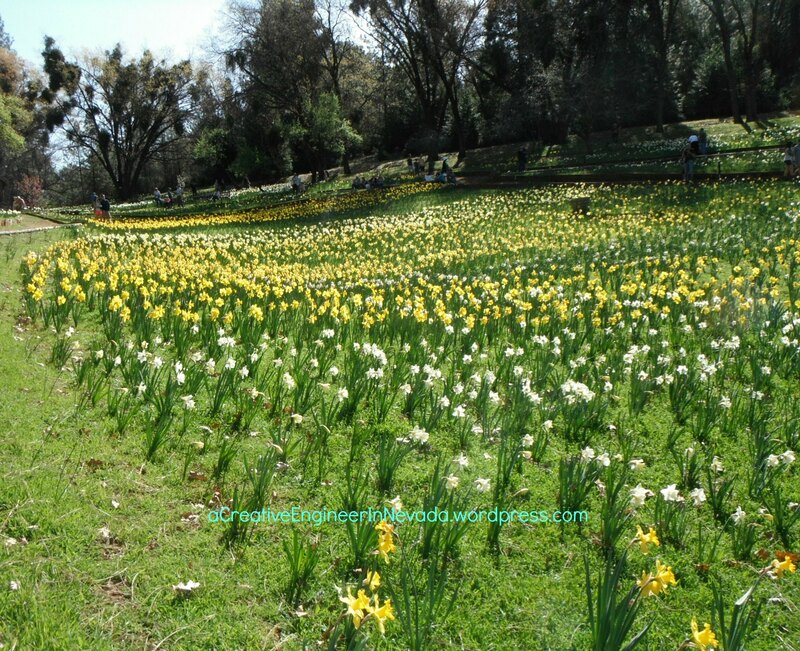 Our first stop was Daffodil Hill, CA (near Sutter Creek, CA) – it happened to be opening weekend. It is free to go to Daffodil Hill, but they do have donation boxes out. We walked around for a while taking photos (along with lots of other people) and then enjoyed lunch across the street (a service organization was serving it) before heading on our way. Now about another cool (photo) book. The husband picked up the above book at the library. Considering we have lived our entire lives in or near Northern California I didn’t think I would really look at this book. But, when I saw the cover and realized I didn’t know what town it was (turns out it was Sutter Creek, CA which is near Daffodil Hill) I figured I would at least flip through the book. The book talked about many small towns in California . It was amazing to realize that we had been through (or investigated) many of the towns (at least the ones near the Sierra Nevada Mountains in Northern California). What new photo books have you checked out lately? Poll – What do you want to see? I figured it was time for a poll. I have 30+ draft posts all needing a photo or something and new ones in my head. So, I am trying to decide what topics you are most interested in (I will always have a little bit of a lot of topics, but trying to figure out which ones to finish first). So, please vote for the top topics you want to see or add your own topic. The poll will be open for a week. Have you ever thought of going to a Consignment (or Thrift) Store on vacation? Well, daughter forgot to take a belt with us on vacation so we looked up the local thrift stores. There was a Goodwill (farther away) and a consignment store a few blocks from the condo we had rented. Before we went I realized the long sleeve denim shirt I had brought for a cover up was making me too hot so I was hoping to find a dress type item that would work as a cover up (then I would not need to wear the denim shorts either). So we went to Rainbow Attic in Kihei, Maui. Daughter found a belt for $6.00 (decent price considering we were in Hawaii and not in a big town) and I looked at the dress type items. There was a few sleeveless dresses in the $10 to $20 range that I tried on. One was huge, another was too long (to the ground) and the one priced $20 fit nicely (over my swimsuit) and came to just below my knees. I had to debate if I wanted to spend $20 for, but finally decided it was better than everything else so it left with us. What I didn’t know until later was the dress brand ‘Tommy Bahama’ was a NAME brand since there was a store in the Shops at Wailea (expensive shopping center). And, I didn’t know until now that their dress start at $88 on their website. So, we have multiple photos of me in my ‘bargain’ dress, I spent about 5 days wearing the dress over my swimsuits and I was definitely cooler walking around in it (the last day I had to wear a shirt and short as a cover up since the dress went lower in the back and my upper back was starting to get toasted from snorkeling). Now, I have a fun dress to wear around home in the summer also. Do you eat grass fed beef? Have you ever tried it? When we stayed in Hana, Maui for a few days on vacation we took most of the food we thought we would eat with us (no, not from home, but went to the Safeway near the airport). We decided we would go out to eat, etc in Hana at least once. Well, the Hana Ranch Store had some Hawaiian made Chocolate Macadamia Nut ice cream so we picked up that (who could resist?) and we decided to pick up a package of Grass fed hamburger (from a ranch on Maui). Our choices were really the grass fed hamburger or small steaks (hey, it is a small town). All we had in our condo was Kirkland Sea Salt (which was completely caked over – what humidity will do for you) and pepper. My first thought was I hope the hamburger had a good flavor since there wasn’t much we could do to improve it. We were pleasantly shocked at how good the hamburger tasted! Since we are now home and live in area with cows I am seriously thinking of looking for some grass fed beef to see if it tastes as good.